Some people swear by the phrase “Once a farmer, always a farmer.” While Dan Berube veered away from farming for a while after being raised on a small farm in Dracut, MA, he found himself craving the outdoors again, eventually growing more crops than his family could consume. Realizing his strong passion for farming, his father suggested Dan enroll in New Entry’s Farm Business Training Program, residing not too far from him in Lowell, MA. 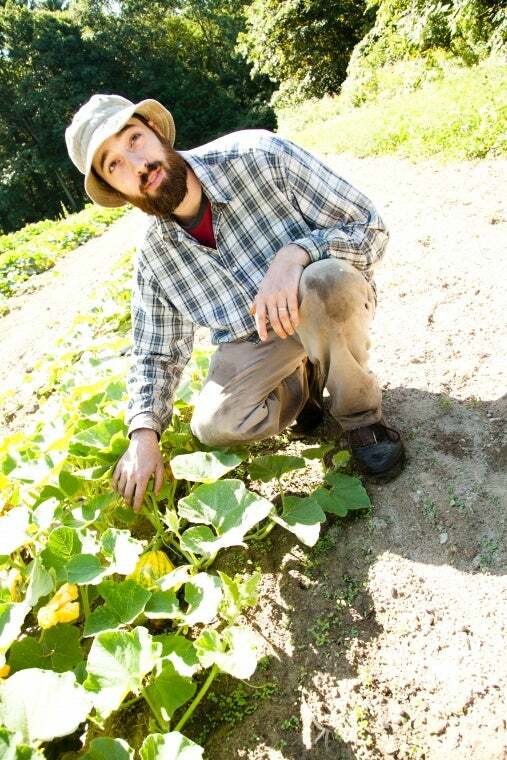 Now, four years after graduating from the program, Dan has his own farm in Dracut, known as Berube Farm. This past year was Dan’s first growing season on a new plot of land after utilizing one of New Entry’s incubator fields for several years. So far, Dan is very pleased with his farm, which is approximately five acres and is located nearby his parent’s home in case he needs to borrow equipment. Dan focuses primarily on growing vegetables and some blueberries, with hopes of expanding fruit production as the years go on. Roughly half an acre was under production this past summer as Dan wanted to become more familiar with his new land. Knowing that each plot of land has unique qualities, Dan has tried to focus most of his energy on “getting a feel” for the land rather than on producing high yields. He wanted to take the time to assess and evaluate his new property to determine appropriate irrigation and pest control. His goal is continue to increase production as the years go on and once he is more knowledgeable about the chemical, physical, and biological aspects of his farm. Dan cannot rave enough about farming, commenting on its therapeutic qualities and abilities to make one feel accomplished. After tackling a field full of weeds on hot day, a sense of pride and satisfaction typically takes over. The multitude of tasks a farmer must complete, seeing the process of agriculture unfold, is quite fascinating to Dan. It also has given him a great opportunity to interact with the community and answer questions about his production process. Through his CSA, he can inform customers about the different varieties of crops he grows and what foods are best used for, such as cooking. The feeling of recognizing what he has actually accomplished gets Dan out of bed and ready to farm. According to him, “it is just fun!” His concentration this year has been primarily on the people and being able to share food with them. He used his background in theater to make an analogy: “You can rehearse a play forever and it can be great, but if you don’t share it with an audience, then what did you actually do?” Sharing the end result of a product is really important, whether it is a play, or fresh, local vegetables from a farm. There is a certain spark that makes a farmer successful, not just the end profits. Dan has noticed that those he viewed as “successful” have a true, whole-hearted passion for farming. Developing a network has been one of the major benefits from completing New Entry’s training program. Dan claims that he has been able to exchange notes with fellow farmers and receive advice from others as to how to make his own farm business a success. To all new farmers, Dan suggests that you “don’t rush” and “think about the logistics” of how your farm with work. What are the exact steps one will take to actually produce a decent crop for harvest? It is important to make sure one knows what they are capable of and how much time they can commit to their farm business. Dan certainly follows a lot of the advice he gives, raising a young son, working a different day job, and having a summer CSA, all while making sure he dedicates time to his new farm. If you love farming, then you will certainly make it happen. For more information about Berube Farm and to get in contact with Dan, you can visit his website at http://www.berubefarm.com/. Written by Stephanie McCulloch, 2017.